Oudh seems to be THE major trend in perfumery and as recently as this season we have two launches featuring it, the excellent Epic by Amouage and the shortly launching Al Oudh by L'Artisan Parfumeur. However, the market is becoming so increasingly busted by oud-this and oud-that that a closer examination of truths, rather than claims, is needed. Only if you have been living under a rock, have you not read a hundred times already that oud/aoudh/aloeswood is the aroma-rich prized resin produced by the pathological secretion of Aquillaria trees when attacked by a fungus. Nevertheless, much as the ad copy circulating and the articles in glossies insist, there is a mythology built about oudh in western fragrances which doesn't exactly justify the tsunami of oud-based fragrances launched in the past few years. Several fragrances which feature notes of oud in fact use a synthetic substitute in lieu of the extra-expensive, ultra-rare ingredient: It was a mere consequence of the eternal law of offer and demand. 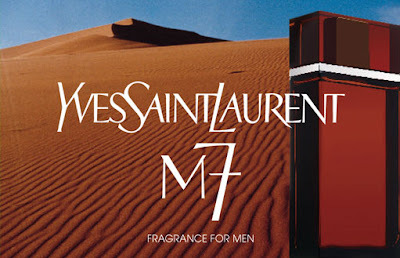 That's how a designer scent with oud "notes" (YSL M7) even became possible. So many fragrances on all price levels as we will see below simply cannot be based on real oud. Synthetic Oud in the Majority of Perfumes you say? Even if the whole Southeastern jungle is eradicated in its pursuit, as apart from endagered, the mere process is so time consuming (often necessitating HUNDREDS of years for the noble rot to manifest itself sufficiently in the wood that produces the essence) that it's a logical impossibility. By Kilian freely admits using the synthetic, to their credit. Firmenich, the aromachemicals giant, has a nicely rounded synthetic base, the Oud Synthetic 10760 E. Seriously hip niche brand Le Labo uses it in their Oud27. Interestingly the material bears some sentising dangers which might bring it into axing under a future IFRA Amendement perfumery restrictions policy. Givaudan also have Agarwood Orpur/"Black Agarwood base" which is another product used to substitute the golden nectar in fragrance releases, reflecting the particular scent of burning Agarwood chips and amalgamating ambery, olibanum and balsamic nuances. If the pace of using oud synths escalates everyone will be wearing "ouds", the way at some point they wore acquatics or gourmands a total defeat of the purpose of "coinnoisseurship" which is so brandished in the oud-selling game. Not to mention that by that time, with the help of Bath & Body Works, there will be an oudh for every budget (Ironically enough yes, there is one by B&BW as we speak! ), which proves the statement above. But let's explore this fascinating material and the synthetics that often imitates it in this guide on building blocks of perfumery. Agarwood or Oud or Oudh or Aoud (the name taken from the province of Oudh) is the resinous heartwood from Aquilaria trees (predominantly from Aquilaria malaccensis), evergreens native to southeast Asia. As they become infected with mold (Phaeoacremonium parasitica, a dematiaceous fungus) they compensate by producing an aromatic resin over the course of several decades. The damage is so extensive that agarwood sinks in water. The growing of the infection results in a rich, dark resin within the heartwood. That resin is known as gaharu, jinko, aloeswood, agarwood, or oud/oude/oudh, valued in many cultures since antiquity for its distinctive aroma ~terribly complex with nutty, musty-earthy undertones redolent of undergrowth. Agar use dates back to prehistory: mentioned in the Bible, ancient Persian and Sanskrit religious texts and part of the first historical biographies in Sanskrit. Oud is also inextricably linked to Assam’ s cultural heritage, since the Indian monarchs employed the used bark of the Sasi Agar tree as writing-material for chronicling their royal circulars. Oud nevertheless is prohibitevely expensive, fit for royalty only, even for niche and ultra-expensive brands and quite rare. One of the reasons for the rarity and high cost (above $62,000 cash for one kilo) of agarwood is the depletion of the wild resource: Since 1995 Aquilaria malaccensis has been listed in Appendix II by the Convention on International Trade in Endangered Species of Wild Fauna and Flora, while in 2004 all Aquilaria species were listed in Appendix II, even though some countries have reservations for the latter listing. Middle Eastern or French perfumers seeking oud at source must establish ginormous bank funds in the pertinent countries, because governments are aware of the trade capitalizing on it. Additonal obstacles arise from the sheer reality of harvesting: Dead infected wood cannot be distilled and heavily infected live wood is not worth it as the wood itself is so more pricey. Thus the only wood distilled is live. Distillable wood is only good for a few months on the other hand, as the essential oil cells dry out, making oud a stratospherically expensive business. Besides there are grades within the product: The highest quality comes from the tree's natural immune response (known as agarwood #1) while an inferior resin is rendered by deliberatily wounding aquilaria trees (agarwood #2, within which there aslo several grades of quality). Adulteration is not unheard of either, according to Tryvge Harris. The average oud available in the US will have changed hands at least 10 times (! ), while rumours abound about Chinese factories who churn out beautiful but fake product ~made of the lowest possible grade agarwood soaked for a month in synthetic (European manufactured) oud. It's also worthy of note that Arabs are not that concerned with purity as might have been supposed, instead focusing on the pleasure principle the aroma brings. "The scent of Oudh sometimes called Agarwood or Eaglewood is so incredible wonderful. It has all kinds of shades, it's smokey, deep woody, a bit sweet in an intriguing way. It even has some green notes and some kind of mouldy notes. It's hard to describe the scent. It reminds me of a blend of vetiver, birch tar, sandalwood, guiacwood, vetiveryl acetate, patchouli and some spicy notes like the note of clove". One of her readers gives a price ballpart as well: The pure Oudh Oil Grade A costs about USD300.00/12mls (1 Tola) and the Resins for Grade AAA is about USD 7,000. The difference in smell in the finished product is also relative to how oud is treated as a "note" from a perfumery standpoint (regardless of whether it derives from a natural or a synthetic source): From the Band-Aid note of Montale's Aouds (due in several cases to the phenolic guaiacwood used in tandem) to the smoother versions like in M.Micallef Aoud Homme when the lactic notes can pop up under the shriller introduction. Le Labo went for a camphoraceous feel with pungent rather than burning tonalities, while Tom Ford extended the effect with lots of cedar. "Oud (pronounced ood) smells expensive and it is. What it perhaps has going for it most is its obscurity and ineffability. There really is nothing quite like it. Hence its appeal. While the cultivation of agarwood can be traced back to ancient Asian civilizations, only recently has oud become the note du jour in high-end Western fragrances from Yves Saint Laurent's M7 to Tom Ford's Oud Wood." The truth is somewhat different than what you often read in the press, as we have proven. Fragrances stating oud notes start as low-end as Culture by Tabac: Arena di Roma by Mäurer & Wirtz (2002) and as mainstream as Versace pour Homme (2008) or Farenheit Absolute by Dior (2009). Ava Luxe, an ultra-niche brand with remarkably low prices states oud as a note in her unisex Chaos. Of course there are several niche players involved as well: From "classic oudet-cadet" Montale (Aoud Leather, Black Aoud, Red Aoud, White Aoud, Bois d'Aoud, Louban, Aoud Rose Petals ~the latter incidentally is sublime~ etc.) and the Arabian real mcCoy El Haramain's line-up to By Kilian Arabian Nights Pure Oud (and Cruel Intentions) and Le Labo Oud27. And from the newest Midnight Oud by Juliette has a Gun all the way through Ormonde Jayne Ormonde Man (2004), M. Micallef Aoud Homme, all-naturals Ayala Moriel (Charisma, Megumi, Razala), Dawn Spencer Hurwitz (Prana) and Neil Morris (Taj, Fetish, Flowers for Men Gardenia, Burnt Amber). If you want to smell real, medicinal expensive natural oudh beyond any doubt to get a feel of the material go no further than Anya's Garden Temple: the fragrance is almost entirely comprised of oud's dense complex notes. Mona di Orio's Oud also uses an amount of the real thing, accounting for the very pungent yet layered smell. And remember that as with anything when there is great demand, the offer tends to cut corners. Think about it next time you're asked stratospheric prices and go by the only rule-of-thumb that should apply in choosing fragrance: how much pleasure it gives you! Additional reading on the Eastern use of aloeswood in incense as well on this link. 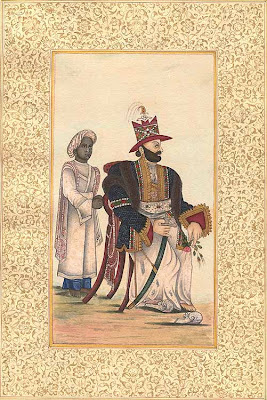 Painting of As Afuddaula, the nawab of Oudh via Exotic India Art. 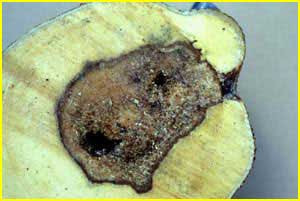 Pic of agarwood rot by Robert Blanchette, University of Minnesota, Advertisement of M7 via easycorner.com. Nice piece, I am going to post a link to it from our blog. The price on aloeswood is only going to go up, even with the introduction of the farm harvested kinds (there really is a difference in scent. Thanks again, love your writting. I'm a huge oud fanatic, so I read this with tremendous interest. Thank you so much for listing the "touchstone" scents-- the ones that let you know when you're really smelling the real thing!! I've been spending a lot of time with Juliette has a Gun's "Midnight Oud," and I have samples of both Le Labo Oud27 and By Kilian waiting to try-- I'm glad I read this first--knowledge is power! thank you for your kind words (and linking). It's inevitable that the price can't get lower, but the only way is up: after all, the smugling and the endangering of the species only makes it even rarer. thank you very much, you're welcome. I had touched on this on several occassions while speaking of oud-notes in some fragrances, but it needed its own seperate article I thought if only to be exhaustive and illustrate the differences. Good luck with your sampling! Hi, I think this is the first time I've commented, but I've been reading for a while and enjoy the blog. I'd be interested whether Le Labo's Oud 27 contains any trace amounts of real oud, bolstered and amplified with the synthetic, or whether the two don't play together well in a perfume. Or whether they are too similar to bother with using both. A blend would add a hint of authenticity to the perfume, and would keep costs reasonable. I've tried a few (Black Aoud, Aoud Homme, Epic Man, Midnight Oud, Oud 27) and am not sure where real oud starts and the synthetic ends, and am starting to think the perfumers are messing with my head by combining the two! Absolutely brilliant post... I just found your site through researching Peau d'Espagne. Did you know in the 19th c. there was an Oude Sauce? It was bottled but also made at home with tomatoes, onions, chilies and dried fish and it was eaten with cold meat. I can't wait to read more of your blog and I'm dying to smell real oude now! I am in awe of your ability to break down all these difficult and complicated matters and present it in such a concise way. I never knew there were oud aromachemicals involved. How shocking, in view of current prices asked! I suppose it's a question of how much the market is willing to pay. Thanks so much for being the beacon of solid information on the Net!! I ADORE your blog. I'm loving oud right now thanks to Nasomatto's "Duro", so this write-up is particularly appreciated. Thanks for a most enlightening post! My first experience with "oud," which I thought was ghastly and which smelled exactly like a Band-Aid, had me thinking that there was some mass hysteria afflicting niche perfume fans. I'm still not sure I've actually smelled it, but will keep trying! thank you, welcome (hope to see you often) and interesting question!! There is a solid basis in what you say: using a minute amount of real oud (assuming it's a good grade) say by tincturing your alcohol with it lends authenticity, while the synthetic base can extend that effect. The bases however have such a powerful effect that the use of the natural is not necessitated in so many terms. If one has the free budget to spend on some, like Amouage do, then all's well and you should know you're smelling the real deal. Otherwise (like the YSL or Dior offerings) it's logical to assume they don't, not at all. But the issue isn't whether the real deal or not is used, because as discussed, even the real deal has nuances of quality and the raw materials providers all too often "cut" their product thus making it inferior (it's totall common practice and one of the great discomforts of the perfume companies who source the dealers). you're too kind. I think it's important to present the "arcane" in simple terms so that the consumer knows what they're buying. They're entitled to it IMO. thank you for saying so! Much appreciated and enjoy the Duro: a butch scent, if ever there was one. I liked the Absinth in that series quite a bit! The matter of perception you refer to has been summed up in one of the articles: "Oud appeals to 'the sophisticated' consumer who is willing to take more risks. When you're looking at [fragrance] at this higher level, you have to understand it to know it's cool." Aka, if you don't you're just as well eating out of a paper-bag at McDonald's wearing velours tracksuits and having your roots show three months' grow. Nobody wants to be that person. Therefore, you MUST like oud. My plea? Love a material for what it is, not what it is supposed to be. Oh, E., how I love oud-based scents. I can't wait to smell the L'Artisan, as I've also been loving leathery, animalic creations lately (particularly ELdO Vierges et Toreros and PG Cuir d'Iris. However, I do wish it were available in the 50ml size. I also wonder if, given that the Montales (particularly Black, Red, and Golden) are favorites of mine, the L'A will captivate me. Is it your understanding that Montale probably uses the synthetic accords as well? Not that it matters perhaps, but (other than Anya's) is it obvious if there are there any readily available modern perfumes using genuine sources? Thanks for this piece. Fascinating blog. I'm going to look out for this as it sounds exciting. I'm shocked that at $400 for 50ml, Kilian's "Pure Oud" is in fact NOT pure oud, and uses only synthetic! What a crock. I am very disappointed. But it smells good, doesn't it? Yes, I have read the Dana Thomas book... interesting reading for sure! Pure Oud Oil is such a luxury! I'm surprised that companies like 'ORISCENT' haven't made a mention on these great blogs. Their oud oils are truly amazing. They are highly recommended by Oud lovers across the net and as a woman who thought Oud was only male friendy - I can say with conviction that scents like Blue Brunei and Assam Kinam have 'Scent of a Woman' written all over them. Nothing compares to Pure Oud Oil. Anyway, I can't wait to see the new perfume launching in March, and that is from Maison Francis Kurkdjian. I hope that it will be in his manner, mixed with musc to give it extra animalistic note. Just...can't wait his creation! I've bought 100% real oud oils & oud chips from Oudh Hamilul Missk, Malaysia. My Italian perfumer friend told me that that Missk owned his own oud plantation & oud wild tree in Malaysia, Thailand & Combodia and distill factory in Malaysia. Missk produced few different type pure oud. I really fall in love with his Sweet Wild Borneo & Nirvana Scent with sweet honey notes. He is different from Oriscent. Oriscent is only oud trader like other and bought oils from other seller/small Asia distiller. Oriscent prices are beast, double/tripple than Missk. You can try to look Missk facebook (http://www.facebook.com/oudh.hamilulmissk?sk=info)and have a nice chat with him. Btw, I'm from Singapore too. I was introduced to oud in 2009 when I live in Abu Dhabi, UAE. I haven't smelled all that many oud fragrances, but Montale's Black Oud is very characteristic of what's popular in the Gulf. Not only do you smell it trailing behind every other person, but it is often burned as incense in houses, shopping malls, and everywhere else. One notable exception is mosques; people explained to me that incense isn't used for religious purposes in Islam (at least in the mainstream Islam that they practiced). Anyway, that Montale style (for lack of a better term) is favored because of its strength. It's no exaggeration that people there put on 5 to 10 sprays of fragrance, not just 1 or 2 (and now I'm in the habit of doing the same thing!) They like their fragrance strong. If you love perfume, move to the Gulf region. You can put on as much as you want. I'd like to move back over there.